TXO plc is an oil and gas exploration and production company focusing on onshore oil wells in the East Texas Oilfield in the United States. The company uses modern technology to reopen inactive wells, previously shut in due to low oil price, and bring them back into production. As at 31 March 2005 reserves are estimated to be 10.4million barrels of oil. 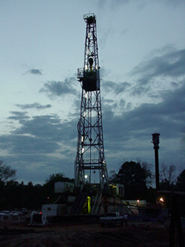 Following acquisitions in 2004 and 2005, the company now holds interests in 348 wells in the East Texas Oilfield. The company has offices in London and Longview, Texas. M-C Production & Drilling Co., Inc.
TXO's shares are traded on the Alternative Investment Market – – of the London Stock Exchange under the ticker TXO.